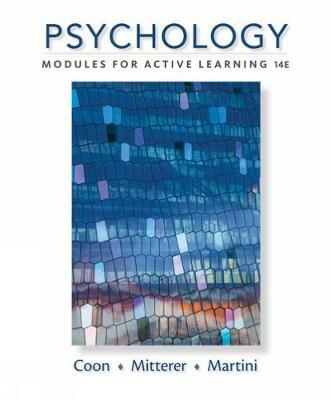 PSYCHOLOGY: MODULES FOR ACTIVE LEARNING combines the highly effective SQ4R (Survey, Question, Read, Recite, Reflect, Review) active learning system, an engaging style, appealing visuals, and detailed coverage of core topics and cutting-edge research in one remarkable text. Fully updated, the fourteenth edition of this best-selling text includes new content that takes you beyond learning psychology as a set of facts to learning psychology skills that make a difference in your everyday life and future career. For instance, active learning modules teach you about information literacy, behaving ethically, giving memorable presentations, leadership, managing your behavior, coping with stress, optimism, and many other topics that you can apply right away. The text is also available with MindTap, a digital learning experience featuring an e-book, videos, flashcards, and cool apps -- including one that reads the text out loud.